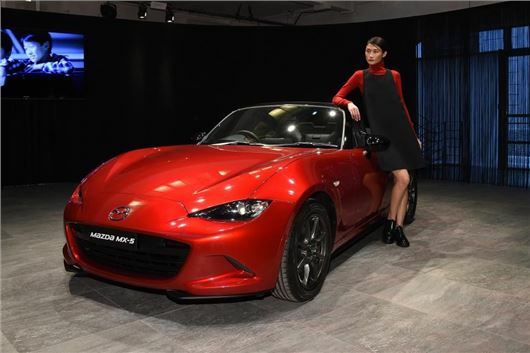 Mazda has announced that the new MX-5 will cost from £18,495 when the order books open on 27 April, with first customer deliveries beginning late summer. Full specification details have been released, with Mazda bringing five trim levels to the UK, beginning with SE and bookended by top-of-the-range Sport Nav, priced at £23,295. Two engines power the MX-5: a 1.5-litre petrol unit with 131PS and a 2.0-litre petrol with 160PS. Both are four-cylinder and naturally aspirated, and are branded Skyactriv-G. There's no details about economy yet, but expect the 1.5 engine to emit 139g/kmof CO2 while the more powerful 2.0 unit will pump out 161g/km. The full trim range comprises SE, SE-L, SE-L Nav, Sport and Sport Nav, with all models featuring LED headlights, alloy wheels, a leather-wrapped steering wheel and manual air conditioning. SE-L specification cars get LED daytime running lights, climate control, Bluetooth, DAB radio, cruise control and a seven-inch touchscreen to control media and phone functions, called MZD-Connect. SE-L Nav adds navigation. Move up to Sport and the MX-5 is furnished with such luxuries as automatic wipers, rear parking sensors, keyless entry, heated leather seats and a Bose surround sound system. Sport Nav adds...you guessed it. 16-inch alloy wheels are standard, but within each specification there are some trim variances depending on engine choice. So, SE-L models with a 1.6-litre engine get smaller wheels, while a 2.0-litre SE-L comes with gunmetal grey 17-inch alloys, for example. Similarly, Sport models with a 2.0-litre engine come with uprated Bilstein suspension and a mechanical limited-slip differential. Buyers who order their cars with Mazda prior to the summer launch will enter a prize draw to drive an MX-5 around the circuit at Goodwood, as well as two tickets for Mazda’s VIP area at the Festival of Speed in June.